Victoria Beckham took to twitter at the end of the week to participate in a Flashback Friday with an epic share. The designer/ former Spice Girl seems to be cleaning out her closet as she shared a look at a dress that dates back quite far. When we say "far," we mean "far." 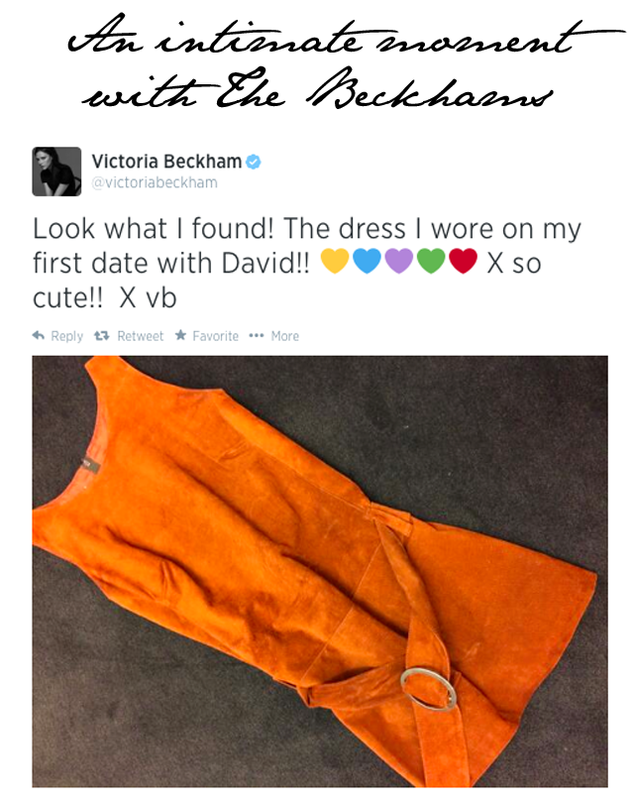 This is a dress that Victoria Beckham shared with the note: " Look what I found the dress I wore on my first date with David!!!! So cute." Well, if you do your research, or if you're a living large Spice Girls fan, you'll recognize said dress from promo shots that were taken of the Spice Girls back in the day, back in 1997, when David and Victoria first started dating. You may also remember that Victoria Beckham loved this dress so much, she also had the same ensemble in brown. Just a little factual information there for you. So what's next for the dress? Who knows. Maybe Posh Spice is just walking down memory lane, or perhaps there's a V Beckham jumble sale in our future? We'll be the first to give it a shout out if one's in the works.